Many people must have believed that it doesn't get cold in Africa. Houses are built with braai-areas, pools, lapas and verandahs. Not central heating and double-glazed windows. At least it doesn't go to zero Celsius or below, in Clanwilliam. On really cold winter mornings, the chill factor might be severe, but the bite of the highveld isn't there. A good winter's day means snow on the crags of the Cederberg, flowers where you're standing, a clear blue sky and a temperature of around twenty degrees Celsius. Almost short sleeve weather. A bad winter's day means dark clouds, the day's high at around ten degrees, perhaps rain, and of course, flowers in hiding. This is July and August weather. Indeed there are more better than worse days, but flower-seekers on limited time schedules have to take their chances. Our winters are short, benign compared to European winters, and offer more promise than threat, in that they feel necessary as a required step towards spring. My favourite seasons are autumn and spring, because in a good year they stretch to create many months of a wonderful summer, when evenings are longer, the growing plants know what to do, strong winds are seldom, and if you want to, you can light a fire every afternoon and evening, and create your favourite braai over and over. The crisp lamb chops, or steak, tender, tasty and pink in the middle, perhaps spare ribs, falling off the bone as your teeth merely touch the fire-roasted meat, chicken marinated in peri-peri basting, boerewors hissing with aroma and invitation: I confess to this season of braais at Saint du Barrys. This is more of a family thing than a guest thing, and if smoke gets in your eyes as you arrive (which it shouldn't - I'm being romantic - ) I'm sure you might feel a stab of envy, walking past the flames and the anticipation of the feast. Back to the seasons, and leave the seasoning, with regret. I can see food coming up in future blogs. Spring pulses almost obscenely with fecundity. Once the tips of seeking tendrils blossom and bunch, the orange orchard across the way begins to swell. The scent - no, this is too bland a word - the full fragrance - not sensory enough - the actual touch of fruitful presence that nudges the nose as well as the skin - encompasses night's knowledge and day's declaration of fullness. Sounds a bit like a Hollywood honeymoon, and it's just orange blossoms. Yet the experience is rich if not romantic. The wine. I'm harking back to the braaai, now, and the one that's on my tongue's memory is a cabernet sauvignon. A wine from 2007, and I mustn't advertise, so no names. What happens is that when it curls into the tongue's centre, it reminds the body's centre (that strange place between the heart and the stomach) of many memories of intense yet peaceful happiness. Must get back to the seasons. Summer. The beginning is good, the middle harsh (40 -45C?) the end, mercy. December, maybe, January, yes, February definitely, March, less. You need aircon, beer, sauvignon blanc, not to be on honeymoon unless you're a very hot couple (like boiling) - that's how it is. When I start up the car in winter, it might say 2C. At the height of summer, 54C. This is a car that has been standing, so it's an exaggerated figure. But hot....yes. 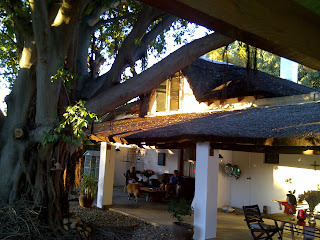 Once you have done the braai, you can always eat inside, in the cool of the hundred year old kitchen with thick walls. Strange, though, most of us like to go back outside and lean back into the shade of the verandah, taking time to dare the season with purposeful relaxation. So the seasons are not neat steps. They're a pattern of living to which we've become accustomed, and which are different, again, in a personal sense. We wait for the wood to be delivered for winter's fireplace, in the office. We ask for delivery of summer's wood, for the braai, and family meals. We watch for crazy robins, poeping as they fly, even through the dining-room. We anticipate the flock of starlings' sudden shout of wings as they fly, for the last time, this season. We become still. solemnly, remembering how souls don't disappear but touch, yet, in unexpected ways when ultimate partings become unaviodable. And each morning we wake, sometimes still tired, always grateful for the gift of continued grace, which comes down on us with rain, sun and stillness, holding our lives in this place of remarkable blessing. Perhaps the Tree deserves to be personalised, and have a name, but we've never done that. Once I thought I would try somethingWordsworthian and listen to the Tree, and I must say, that after thinking really hard about Tolkien, I did hear something quite profound, but I don't talk about it, because people would think that I had been drinking. 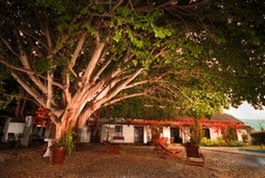 Many guests remark on the Tree when they arrive, and truly, it's a magnificent wild fig. The most frequent question is about the Tree's age. We reckon it's about two hundred years, since it was mature when the house was built in 1904. When we drove into Saint du Barrys for the very first time, it was a cold, clear July day. On the way from Cape Town we had seen bright flowers along the road, and this with the intense blue sky, clear snow-topped mountains and crisp air, gave us a taste of years to come. When we arrived - I can hardly believe it - the only heating was the fireplace in the office. The rooms had those oil heaters with fins. How on earth had anyone kept warm for a hundred years before us? Now we have nine of those reversible aircons which heat quickly and effectively. The seasons differ greatly: no talk of heating in the summer months, with temperatures ranging from mild thirty degrees Celsius to forty five on wicked days. The Tree is a blessing in these months, offering shade in which to hide from a stare which can be intimidating from such a sun. I don't think Saint du Barrys would be Saint du Barrys without the Tree. Apart from functional values, its livingness can easily be taken for granted. 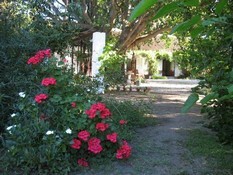 It is forever trying to walk through the dining room, on the way to the Jan Dissels River which isn't many meters away. The aerial roots grow downwards quite quickly, and have to be cut regularly. Once they touch the ground, they'll grab and won't let go. The Tree must host a huge number of birds. We've come to know the difference between their morning and evening calls. We prune back the large branches every three to four years. Our first tree-man had a very limited sense of the horizontal: he seemed to spend much of his life zapping up and down sliding ropes, and anywhere he put his feet was purchase, not of the buying kind, but of bringing down tough trees. In fact, our first meeting was when we glimpsed something landing on the scullery wall, lifting to come down on the dining room roof, then back to the scullery roof - not much sympathy for our humble structures, but what the hang - the thousand meter tree on our neighbour's land was required to come down, and down it would come, correctly cut into, angled, and then pulled by the tree-man and associates, with their feet tightly against our walls and roofs. His name was Luke: we called him Skywalker Luke. In the later year the Tree drops millions of small balls of baby fig. They're hard or mushy depending on the kind of year and rain. Enough work for a team of gardeners and a company of carpet-cleaners. There's also the mulberry tree, but I won't even think about that one right now. One poignant sound that will no doubt travel with us forever is the windchime that hangs from a lower branch. For many weeks it does very little, and then when north-west breezes begin to remind themselves of what it's like to be a full-blown wind, and we hear the sound of seasons rubbing hands, that high and mellow beat says things that completely bypass words. It's a sound, to me, of deep home. Most guests would not experience a week of the Tree's company. Eleven years, so far, in the company of the Tree, is a significant part of our lives, and a very small part of its great growth. Time is relative and mystifying. The Tree has taught me at least that, as well as very much more.